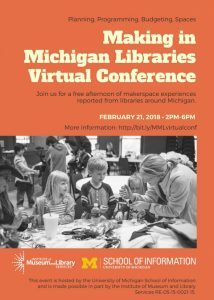 Kamya, Ben, and I were happy to be at the main Hoyt Library at Public Libraries of Saginaw this morning to talk about design thinking as a frame for creative thinking and hands-on making. Here is our slide deck. 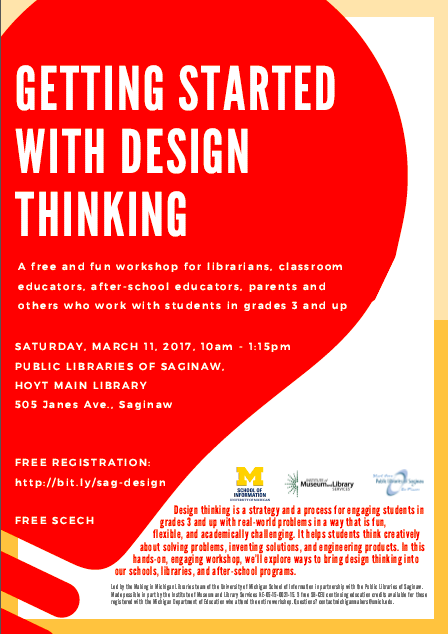 Here is the downloadable design thinking game (with word-based prompts). Here is the downloadable design thinking game (with image-based prompts). Need anything else? Email us at contactmichiganmakers [at] umich [dot] edu.